DUMBARTON lost to Rangers at the Bet Butler Stadium for the second week running — this time in the third round of the William Hill Scottish Cup. This time, again in front of a 1,820 crowd, they made a much better fist of it and pushed the Glasgow side all the way. They were unlucky not to force a replay, but went down 1-0. Because of the unavailability of several first team players, manager Ian Murray fielded three centre halts in skipper Andy Graham, Lee Mair and Mark McLaughlin, and they looked much more solid at the back. With Garry Fleming marshalling the defence in midfield, the pacey Archie Campbell and Mitch Megginson joined Colin Nish at the front, and they made life much more difficult for the Ibrox men, coming close to scoring on several occasions. But it was the visitors who took the lead with the last kick of the first half. Talented youngster Lewis MacLeod sent a perfectly weighted pass to striker Kris Boyd, and he hit the only goal of the game via a post, giving keeper Jamie Ewings no chance. After the break the home side continued with their spirited attack and forced keeper Lee Robinson into some fine saves. But the closest they came to a goal was a shot by Andy Graham. In the final minutes in what was now a torrential downpour, the last chance fell to Scott Agnew, but his free kick went just over the bar. The visitors were the happier to hear the final whistle, and afterwards manager Murray said it was the best performance from his side this season. 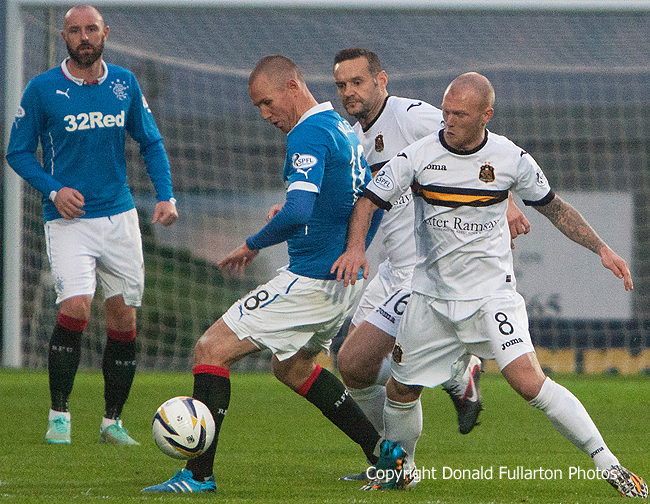 The picture shows Scott Agnew beating Kenny Miller, watched by Kris Boyd and Mark McLaughlin.